The energy of the future! It is 2849, the year of the dawn of an incredible emergence of stellar energy. Rival companies have positioned their exploration shuttles around a star cluster rich in pulsars and are ready to exploit their resources. At the head of these companies, the players will strive to extend their influence by building large space megastructures. 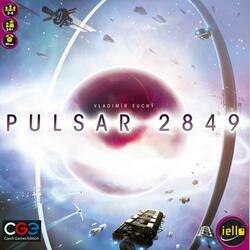 Choose your dice to explore the universe in Pulsar 2849. Each turn, roll a certain number of dice (related to the number of players), sort them by value, then make a "draft" of the dice to take actions, in order to be able to visit unexplored planetary systems, take possession of a pulsar to install a gyrodine generator to recover energy, or build energy transmitters. Victory points represent the performance of each company in the different aspects of energy supply. You have eight tours to make the most of the universe.